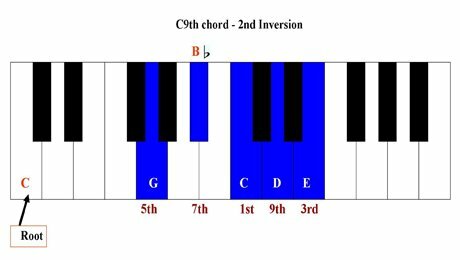 On this page we will be exploring ninth chords and how to play them on your piano. When you are able to play basic chords such as minor, major, augmented and diminished triads in all keys on the piano, then it is time to explore other type of chords. As you learn to play more chords, you will realize that you will have to use up most of your fingers especially on the right hand. This is because intermediate and advance chords have more than three notes. The 9th chord is one example. It is made up of five notes. 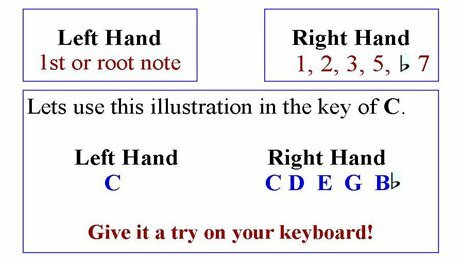 This type of chord is difficult to play on the piano with one hand and so the notes will have to be altered so that they can be played on the piano keyboard. However, before we go into how to play the 9th chord on the piano, let us explore how it is constructed. So which note is referred to as the ninth on the keyboard? The ninth is very easy to find on your piano. 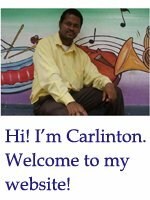 The ninth is one tone or whole step higher than the eight note of a major or minor scale. In this case D comes after the 8th note which is the high C or octave C. This D is called the 9th. This applies to all major and minor scale. So the ninth can be referred to as the higher octave for the 2nd note of a major or minor scale. 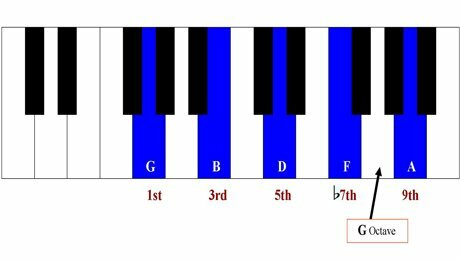 Here is an illustration of the G9th chord on the keyboard. Most piano or keyboard players find it difficult to play the ninth chord in its original position on the keyboard, and so, the notes in this chord are usually inverted so that they can be in reach of the fingers. In this case different voicing are used. In some cases the left hand is used to play some of the notes within the chord while the right hand plays the rest. Here are two common ways in which the ninth chord is played on the piano. The 2nd and the 9th are the same letter on the piano but are located at different pitches because of the intervals used to construct the scale. However, it is a normal practice for musicians to use the 2nd as the 9th to create a different type of voicing. This is done in the second illustration above. 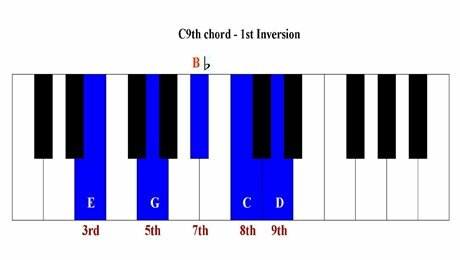 Another easy way to play the 9th chord on the piano is by playing it in 1st and 2nd inversions. Take a look at the illustration below for a clearer understanding. Here are some other types of ninth chords that are played on the keyboard. Major 9th chord – This chord includes a major seventh instead of a dominant or flatted seventh. Minor 9th chord –This is a minor seventh chord with a ninth added to it. Add 9th chord – This is a major triad with a ninth add to it, the flatted or dominant seventh is not included in this chord. Sometimes it is referred to as an added 2nd. 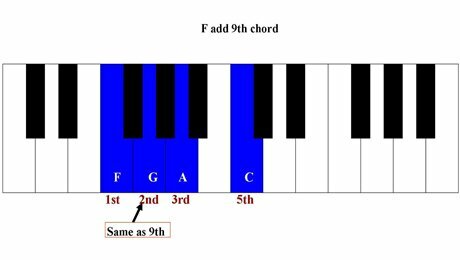 Here is a diagram showing what the Add 9th chord looks like. The key used for this illustration is F major. 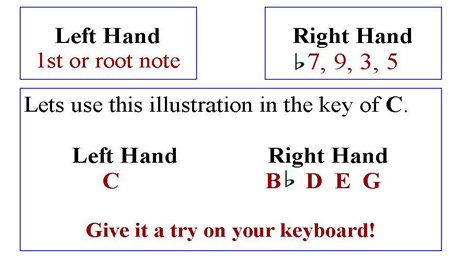 Click here to leave the ninth chords page and return to home page.